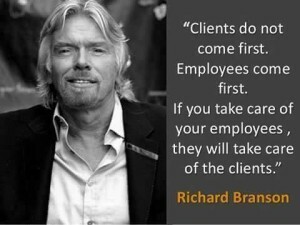 I know, it seems counterintuitive but actually our clients can’t come first, our employees must. Practices that focus on the health and well-being of their employees will reap the most success and longevity. It is the employees that are at the heart, foundation, brand image and of course customer service of your practice or organization. Those of us that work in trauma-exposed workplaces such as veterinary hospitals, animal shelters, healthcare, mental health, etc. owe our largest portion of responsibility to the worker themselves. It is because of the work they do that puts them in the path of vulnerability to stress disorders such as compassion fatigue. Because of that we must support their well-being as it will pay dividends. What is the cost of exhausted and mentally depleted employees on the practice or organization? A big one! Dr. Mike Drummond sums it up like this “How can we expect a client to give our practice a satisfaction grade of 10 out of 10 when every person they interacted with would only give their job satisfaction a score of 2 out of 10?”. Professor Andrew Oswald, Dr Eugenio Proto and Dr Daniel Sgroi from the Department of Economics at the University of Warwick led a study, “Happiness and Productivity”. The economists carried out a number of experiments to test the idea that happy employees work harder. They found happiness made people around 12% more productive. So how does happiness translate for animal workers? Teaching happiness is possible and research indicates that the skills for well-being can be taught and learned: “There is substantial evidence from well-controlled studies that skills that increase resilience, positive emotion, engagement and meaning can be taught to schoolchildren”(Seligman, 2009). Certainly if school children can be taught how to be happier, so can adults. Like many of the things I teach in my compassion fatigue workshops and seminars, much of this comes down to slowing down, being in the present moment and changing the way we think/react to things that happen in our lives. Remember, you ALWAYS have a choice in how you react. Always.